Soups and stews make such an easy, comforting weeknight meal. This is a collection of my very favorite easy vegan soup and stew recipes. I could eat soup and stew year-round. OK, I do eat them year-round. But my obsession goes into overdrive when the leaves start changing color. That’s when it’s time to really beef up that arsenal of vegan soups and stews. 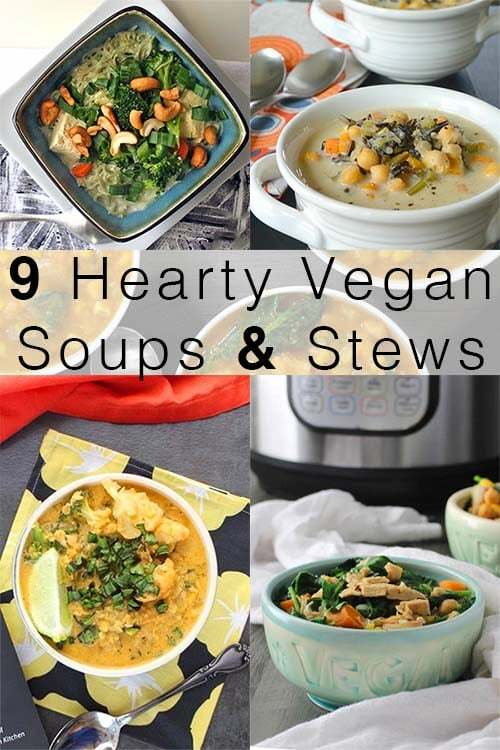 The vegan soup and stew recipes on this list are ones that I make often love. They’re tried and true faves, so they aren’t going to represent every variety under the sun. 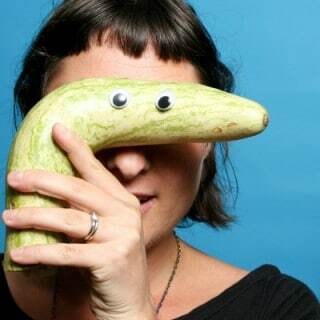 What they do represent is a party in your mouth. Join me! I am medium obsessed with coconut soups, and this is one that my whole family loves. Not only is this soup a delicious, hearty, one-bowl meal, but it truly takes 15-20 minutes to make. The recipe instructions walk you through how to get this meal on the table in no time flat. 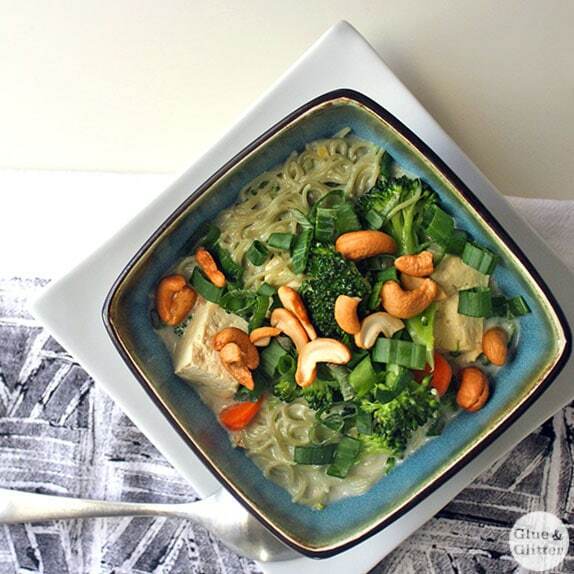 Coconut Noodle Soup that comes together in 15 minutes flat. It’s all about multitasking and choosing the right noodles. Along with a love for coconut soup, I have a big-time curry obsession, and this quick and easy curry hits the spot every time. 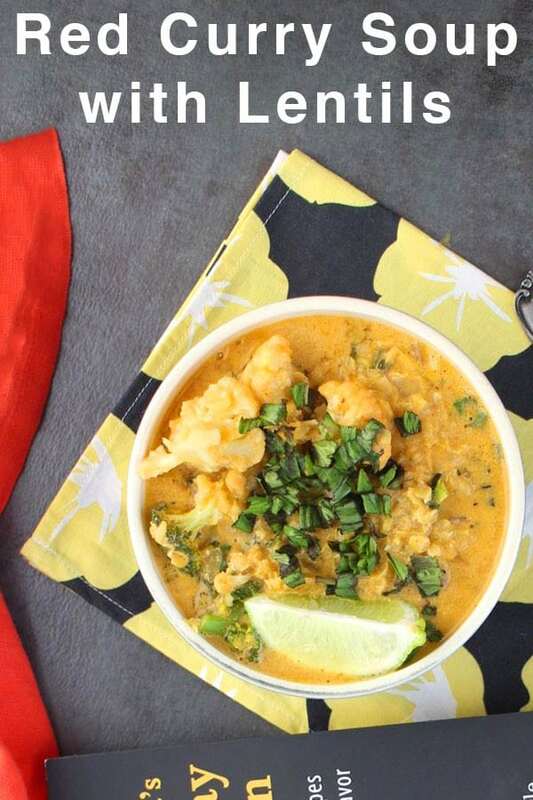 This soup is a fave because it ticks all of my favorite boxes: creamy, spicy, veggie-packed. And, since you make it in the Instant Pot, it’s very hands-off. 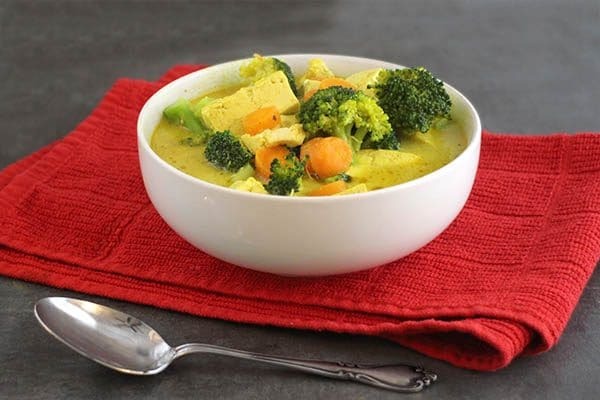 Coconut Curry Soup with Tofu made in the Instant Pot brings the heat and the flavor, and you can adjust the spiciness to suit your taste. It’s ready in less time than it takes to wait for a takeout order. 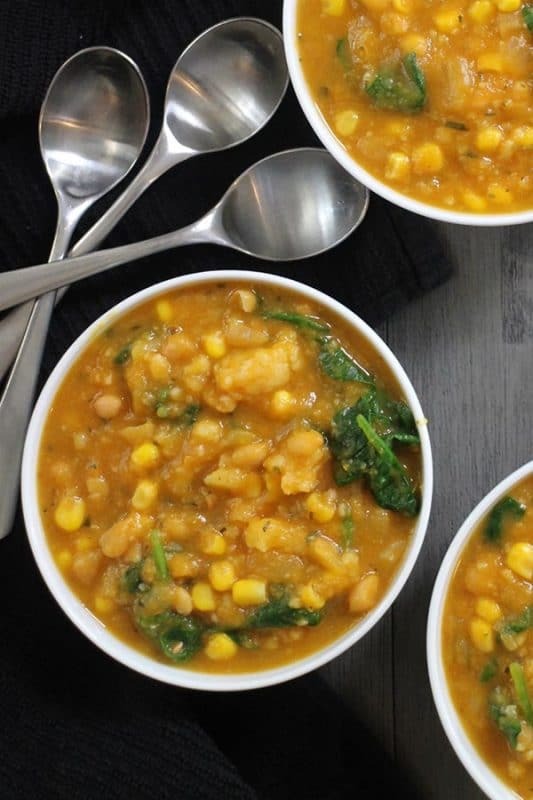 This hearty soup from my friend Amy at Veggies Save the Day is total comfort food. 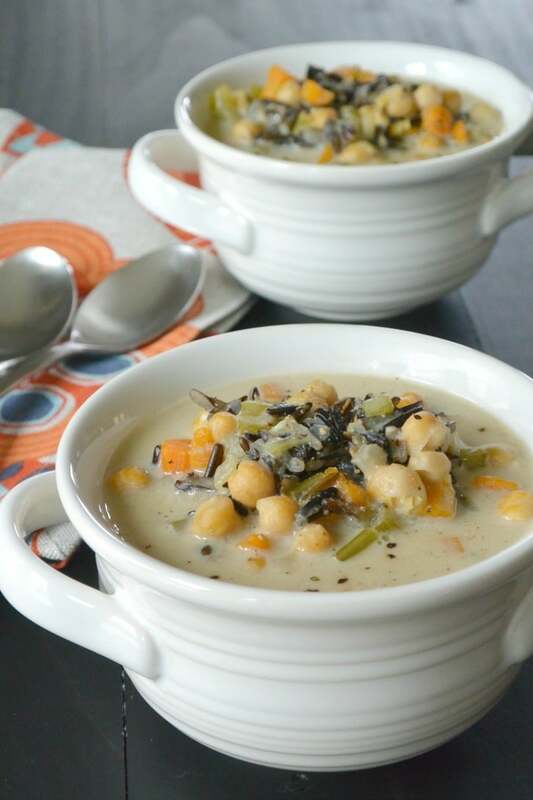 It’s packed with wild rice, beans, and veggie in a creamy broth. This is another Instant Pot soup recipe (there are a lot on this list! ), which means it’s super easy to make. Nothing screams, “FALL!” like pumpkin soup. This is a thick and hearty soup that you can make in the Instant Pot or on the stovetop. It’s a little different from the pumpkin soups you normally see. Instead of ginger as the dominant spice, this soup stars tarragon, and it’s a real treat on a chilly evening! 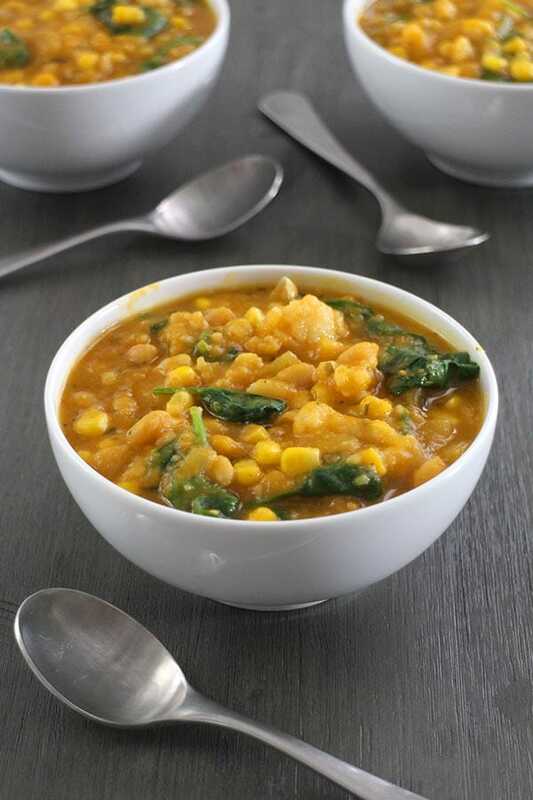 This is another family favorite vegetarian soup recipe. It’s got lots of hearty potatoes, sweet corn, and healthy greens. It’s rich and creamy, and so filling. You can really make a meal out of this soup! My family is obsessed with this vegan chicken stew, and I’m so glad! It’s got lots of veggies in it, and it’s super easy in the Instant Pot or on the stovetop. You can use any chicken-style seitan you like to make this dish – we’ve tried several different brands, and they all worked great. Y’all, my family can’t get enough of this Vegan Chicken Stew. It’s packed with veggies, beans, and hearty potatoes and is so simple to make in the Instant Pot or on the stove. What can I say – we love a stew! This one isn’t as veggie-intensive as the chickenless stew, but it is a bit ol’ bowl of comfort food. Serve it as-is or dish it up over rice, pasta, or mashed potatoes to up the heartiness factor even more. This recipe includes stovetop directions, in case you don’t have an Instant Pot. 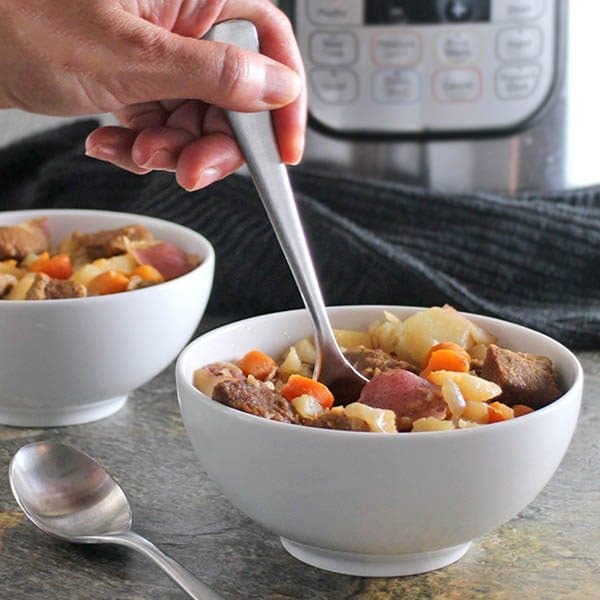 Rich, flavorful Vegan Beef Stew cooks up in a flash in the Instant Pot, and it’s even quick and easy on the stovetop. 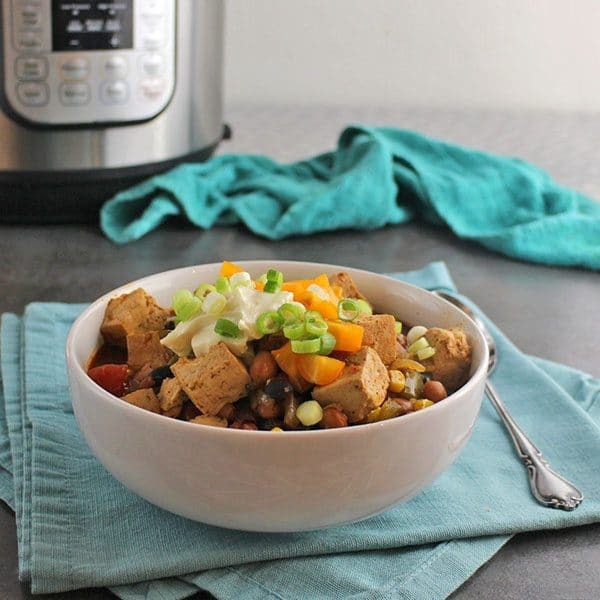 You can make this hearty Instant Pot chili with or without the tofu. You can simply skip the tofu or substitute another can of beans of your choice. My kid loves to mix up the beans that we use in this recipe, which has been a lot of fun! My favorite sub he made was when we used crowder peas and black eyed peas instead of the beans the recipe originally called for. This recipe—from Vegan Richa’s cookbook, Vegan Richa’s Everyday Kitchen—is a cozy one-bowl meal. It’s a red lentil soup in deeply-seasoned curry broth. Richa’s cookbook is packed with easy, flavorful recipes. I highly recommend adding it to your cookbook shelf! 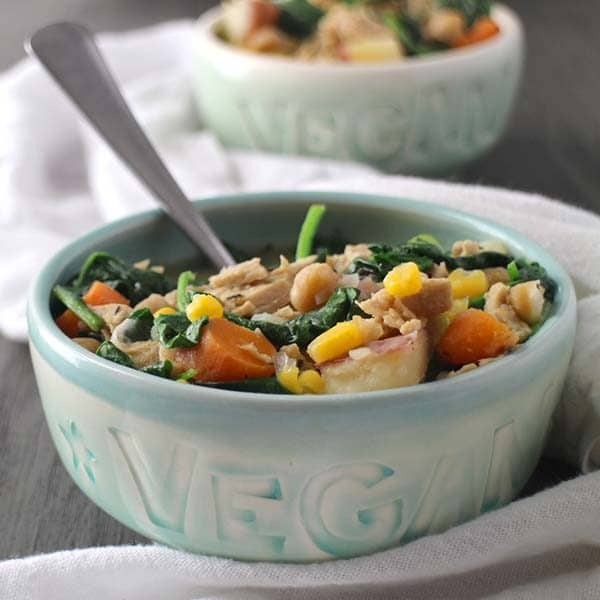 Do you have any favorite simple vegan soups and stews that you bust out during the colder months? I’d love to hear about your faves in the comments!